Toyota introduced the A25A-FKS or 2.5 D-4S engine in 2016 like the first member of its new engine family “Dynamic Force Engines”. It is a 2.5-liter inline four-cylinder gasoline engine combined the newest Toyota’s internal-combustion technologies which can be found separately in previous engines produced in the last years. The A25A engine has a new open-deck aluminum alloy cylinder block with sleeves cast directly in block material. The longitudinal axis of the crankshaft has a 10 mm offset against the axes of the cylinders. The crankshaft has 7 traditional counterweights and one with tooth gear. That gear on the crankshaft drives the balancing unit attached to the engine block at the bottom. The engine got the high-strength connecting rods and lightweight aluminum T-shape pistons with a special resin coating. The upper compression and oil rings have a DLC coating (Diamond Like Carbon). The pistons are cooled with engine oil sprayed by two oil jets for each piston. The oil system was also upgraded. The main innovation is the second generation variable-pressure oil pump controlled by ECM electronics. The engine has an aluminum 16-valve cylinder head with two chain-driven camshafts in separate casing at the top. The angle between the intake and exhaust valve is 41 deg. The intake port has a laser-cladded valve seat while the exhaust has a normal pressed valve seat. The valves are actuated by camshafts via roller rocker arms. The engine is equipped with hydraulic tappets for continues zero valve clearance. The intake and exhaust camshafts are driven by low-friction single-row timing chain with a pitch of 8.0 mm. The A25A-FKS features the Dual Variable Valve Timing system (DVVT). The electric actuator (VVT-iE) is used for the intake camshaft; the traditional hydraulic VVT actuator was attached to the exhaust camshaft. The exhaust camshaft has an additional cam for the high-pressure fuel pump. The head cover is made from polymer material. The A25A engine has a combined fuel injection – in the combustion chambers (direct) and in the intake ports (multipoint). That Toyota’s system is named as D-4S. Each high-pressure fuel nozzle for direct injection has six holes and spray fuel at mid and high engine loads. The low-pressure nozzles in ports have 10 holes. The multipoint fuel injection operates at low speeds and at mid-range together with direct injection. The fuel pressure in the system is a range of 2.4-20 MPa. The engine has a simple fixed-geometry plastic intake manifold and electronically controlled throttle body - ETCS-i. There is no restricted air in the intake manifold, in that reason the engine was equipped with a vacuum pump driven by exhaust camshaft to create enough vacuum in a brake booster. From the exhaust side, there is a stainless steel exhaust manifold (header) with integrated catalyst converter and EGR pipe. The modern environmental rules forced the big changes in the engine cooling system of the engines. The 2.5 D-4S engine has an electric motor-driven water pump, electronically controlled thermostat, and shut-off valves. The new system contributes to faster warm up and optimal cooling on all loads range. 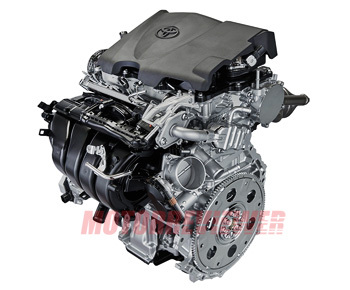 In the result, the new 2.5-liter power plant is the most technologically advanced engine ever produced by Toyota. The maximum thermal efficiency achieved the line of 40% - one of the world's best results for a conventional engine. Now, when the A25A-FKS moved the output and fuel economy on the next level, the 2AR became the past. 0.3 (0.4 qt) – oil filter. The engine has even more complex design compared to the 2AR engine series. There are a lot of electronics, sensors and small parts as a potential failure. Hope, that Toyota still uses good quality components and precise assembly. We also can see what the laser-clad seats in the head are unremarkable, and the cast-in cylinder sleeves don’t have enough juice for a rebuild. That all has a bad influence on the reliability and limit the engine life. It is hard to believe what the most engines will go over 150,000-200,000 miles line. The A25A-FXS. The special version for hybrid vehicles application. It has a higher compression ratio 14.0:1 and slightly less power output.